To a very special mod, happy birthday, Esty! & many returns of the the day! Have a good day today, Esty! There are worse things to celebrate than one's birth. And as you know: age only makes one better! I would be completely remiss if I didn’t wish Esty the happiest of birthdays as well. Esty came all the way across the Atlantic to see a Lord of the Rings exhibit with me and my family (OK, OK, she might have come to see some of her relatives as well), and I count meeting and getting to know her as one of the top experiences of my adult life. Of her I can truly say Elen síla lúmenn’ omentielvo. I hope you have a most enjoyable day, Estelyn! I have nothing fancy to offer, I'm afraid. Just enjoy yourself as immensely as possible. Awww! Thanks, everyone, for your good wishes! You make me feel so special! Thanks, Brin - you were the first on this thread today! Thanks Rikae - "high priestess" good wishes must be even better than plain ones! Elempi, thank you for throwing me such a colourful party! TM and Celuien both made use of the special Merisu smilie - thank you! 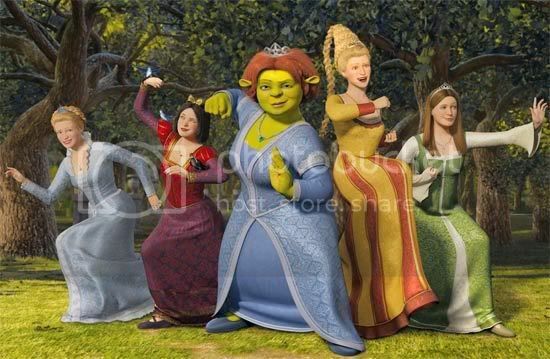 Ah, Bb, the memories - one day I will go back to my Fiona avatar. That picture is absolutely hilarious! 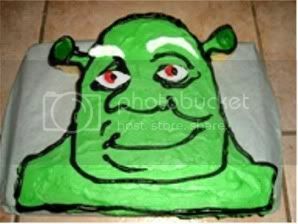 And thanks for the Shrek cake! Pio, that is a spectacular birthday quilt - wish I had one like it for real! Thanks for the lovely picture. Noggie, age has definitely improved me, and it's not over yet! As they say, age is mind over matter - as long as you don't mind, it doesn't matter! Thanks for your good wishes. Aww, Thena - the pleasure was all mine! Meeting you and your family was one of the highlights of my travels! I would gladly go out of my way to see ya'll again. Folwren, like the Hobbits, I enjoy the simple pleasures of life - no need for fancy stuff all the time! Thank you for your good wishes. Slightly late but here all the same ... happy birthday Esty! I hope you had a fantastic day or, if you're celebrating at the weekend, that you have more fantastic days. Belated birthday congrats to you, Esty! Thanks for being around, you're priceless! Happy Birthday to the insightful MatthewM. May your passion for Boromir the Brave ring through the hills, and may all his slanderers flee! Happy Birthday, Aylwen! Miss you being around a lot! Wow wow wow! Happy birthday indeed, Sir Everpresent (well, except for WWIV), Gil-Galad the adult! And what now? It can't be. Cailín and SPM! Happy birthday indeed! Though I haven't seen Caitlín around, I've read your WW and it was great! Well, I've not only read SPM's WW, but I've also been in it, and it was awesome indeed! Anyway, anyway! Have a nice birthday! Last edited by Volo; 06-20-2007 at 09:11 AM. Happy birthday to you both! Hope great days have been had all round. Happy birthday to Cailín and Sauce and many congratulations! May you have good days and paljon onnea! Cailín, you can have a good day too, if you like. Hey, it was already 00:25... And a after all, not a very familiar member to me. Etc. Birthday happy to Naria, the Modmistress! Do have an amusing day and return to WW to have many amusing Days! Although, it being the big 4-0, perhaps it would have been better to let it slip by unmarked. Still, there it is, I am now officially middle-aged (hmm, does one get to live a middle-aged life in middle-earth ...?). In so far as relevant to the Downs, my birthday presents included The Children of Hurin, a photo shot of Frodo and Sam from RotK signed by Sean Astin, and a wine goblet in the form of an Ent. Tomorrow, I shall be holding my own Long Expected Party, although I don't intend on vanisihing (provided that is, that the aforementioned wine goblet does not get too many refills ...). Many thanks again, one and all. Saucie, it's hard to imagine a downs without you mate. Best birthday wishes. Aaand the party isn't over! Mithalwen, with all the best, I give you a two week holiday from being the executive officer! Congratulations! Happy birthday, Mith! Strawberries also go nicely with chocolate fountains. So belated congrats to two lovely ladies (or should I say "two lovely lasses"? ), Naria and Mith! Love to have you both around here, don't vanish and hopefully both of you had a gorgeous day. Paljon onnea! I know it's too early for you, but I follow my own time, so there. Happy birthday, Brinniel! haha I was just going to make a post saying the same thing. . . but I guess you where just too much further a head in timezones for me to beat you. anyways have a very nice birthday Brinniel. See how loved you are Brinn? No one can wait to say happy birthday to you! So, happy birthday! Hope it's a good one and there are presents, cake and ice cream galore. 'Cause it's summer now and you have to have ice cream. A belated thanks for the kind birthday wishes! I was quite pleasantly surprised, since I haven't said anything here for quite a while. I will never really leave the Downs, though. And Brinniel, happy birthday to you. Or, as we say in Dutch (which you must learn anyway), "gefeliciteerd met je verjaardag!" gefeliciteerd - ge like in german implying something in front of a verb (right? I've never studied German more than one basic course in the Uni more than ten years ago but a lot of verbs seem to have this ge-prefix in them for some reason) and feliciteerd meaning happy or joyous or whatever... felix navidad... so let us celebrate over and over again? met - like German mit or English with? Anyway happy birthday to Naria And belatedly to Cailin. Lommie, these days only octogenarians address me as "Lass"
Thanks to Lhuna, Rune, Rikae, Kath, Cailín, and Nogrod for the birthday wishes. I promise I had a lovely day. Or, as we say in Dutch (which you must learn anyway), "gefeliciteerd met je verjaardag!" Well, if I don't get it as a gift, I'm planning to use birthday money to buy a learn Dutch software program, so soon enough I will know some Dutch...or at least, more than I do now (which is none ). See how loved you are Brinn? No one can wait to say happy birthday to you! Indeed. I most certainly do feel loved.